This Audio Visual Solutions AVS-EXT4KPOC is an HDBaseT Extender set consist of transmitter (TX) and receiver (RX). It distributes HDMI signal via CAT5e/CAT6a cable at 70m/PoC, and enables IR and RS232 pass-through to control local source device from remote or far-end display. Supports bi-directional IR and RS232 pass-through for long-distance control. Supports bi-directional PoC for simplified wiring. Features DIP switcher for choosing Control or Update mode. ① Power LED Illuminates red when power is applied. ② RS232 Euroblock/Phoenix connector for connecting an RS232 data device. HDMI OUT (RX)HDMI port for connecting the video display. ④ CTRL/UPDATE Switch for determining the behavior of the RS232 connection. When in the CTRL position, it serves as an RS232 serial extender. When in the UPDATE position, it allows you to update the Valens IC program by connecting to a PC and running the batch file. ⑤ HDBT OUT (TX) RJ45 jack for connecting the Cat5e/6 cable to the Receiver. HDBT IN (RX) RJ45 jack for connecting the Cat5e/6 cable to the Transmitter. ⑥ IR IN 3.5mm jack for connecting an IR Receiver (not included). ⑦ IR OUT 3.5mm jack for connecting an IR Emitter (not included). ⑧ DC 12V DC barrel connector for connecting the included AC power adaptor. The AVS-EXT60 HDMI extender extends HDMI signal between Transmitter and Receiver over CATx cable. It supports 1080p@60Hz video signals up to 55m including embedded multi-channel audio and HDCP1.4. Built-in EDID make this product compatible with most display and source device, to ensure HDMI transmission. Advanced power design (PoC) allows this product to be powered at Transmitter, and only one power supply is required. In addition, the AVS-EXT60 send/receive IR signals each other over the same CATx cable with IR pass through. Supports built-in EDID to ensure HDMI signals transmission from source to display. The transmission of 1080p@60Hz (max) signal is up to 55m. Supports PoC, the Receiver can be powered via Transmitter. ① CAT OUT: RJ45 connector with Green& Yellow indicators. Connect to Receiver over CATx cable. The Green indicator lights up when powered on. The Yellow indicator lights up when linked successfully between Transmitter and Receiver. ② IR IN: Connect with IR Receiver. ③ IR OUT: Connect with IR Emitter. ④ DC 5V: Micro USB, connect to the power adaptor. ⑤ HDMI IN: Connect to HDMI source. 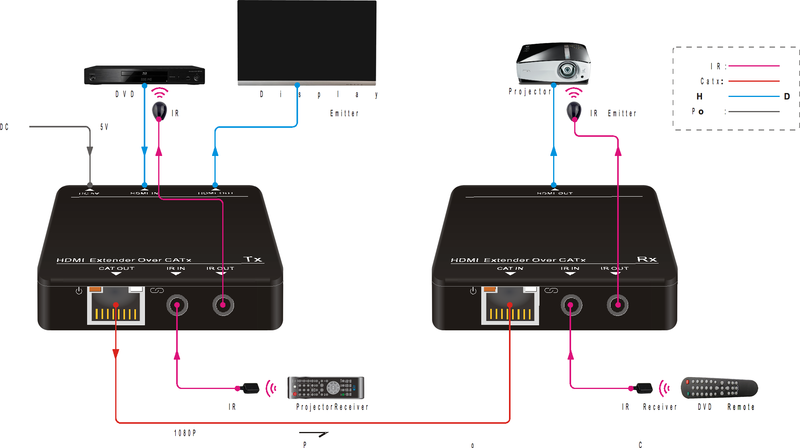 ⑥ HDMI OUT: HDMI loop output, connect to display. ① CAT IN: RJ45 connector with Green& Yellow indicators. Connect to Transmitter over CATx cable. ④ HDMI OUT: Connect to display. ⑤ EQ SETTING: After the system is connected, press this button three to six times repeatedly until the best image output. When the cable, source, or display is changed, or reset the output resolution, it is need to press this button repeatedly to ensure the best image.